By far the best presentation I have heard for a long time. A brilliant session!!! It was very useful both for work and personal life. I learned loads. The course was an excellent wake up call to the importance of networking and reminded me how lax I have been in maintaining relationships. Many thanks for an excellent session: I came away thoroughly enthused and have already put some techniques into practice at a wedding I attended at the weekend. Judith is an outstanding lecturer and handles a room of resistant and defensive trainees with fluency and charm – she makes difficult concepts clear and manageable. The masterclass was both useful and enjoyable. 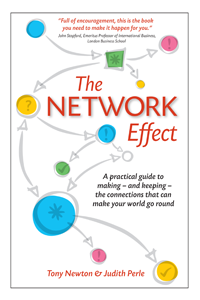 Judith presents an excellent framework not only for understanding the inherent strength of one's existing network, but also the tools to make it more powerful.